Dr. Patino is a premier orthodontist in Concord. The heart and soul of our progressive orthodontic practice is creating beautiful lasting smiles for children, teens, and adults. We are committed to making sure your treatment experience is comfortable, personalized and affordable. At Patino Orthodontics, we are committed to making sure your treatment experience is comfortable, personalized and affordable. At Patino Orthodontics, we want you to love your smile! Dr. Aurora Patino and her talented staff utilize the most advanced orthodontic technologies to create customized treatments for you and your family. Our practice is near downtown Concord, open six days a week, and has built a reputation for quality orthodontics in a welcoming and friendly atmosphere. Our comprehensive services include traditional braces as well as metal and clear and color brackets, Invisalign clear aligners, TADs, as well as the latest in tooth whitening and gum treatment techniques. 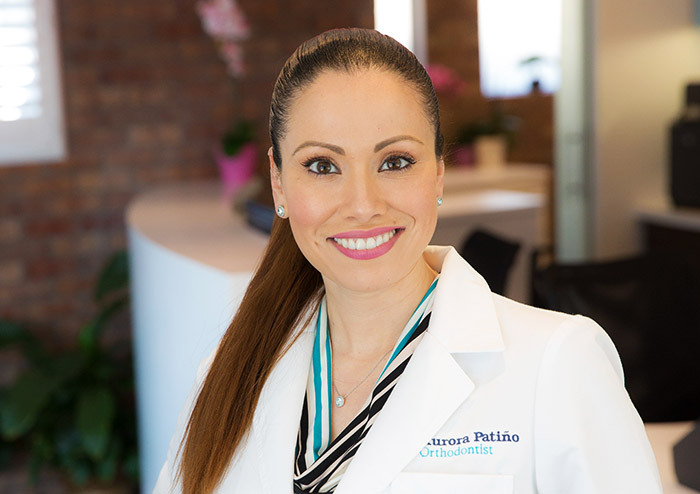 Dr. Patino combines her knowledge and expertise with the latest in orthodontic technology that can help her patients attain beautiful, lasting smiles comfortably and efficiently. We want you to have a positive orthodontic experience in a relaxing environment. Our practice is centered on your convenience, with the latest technology and digital communication available. Call or email us today for a complimentary orthodontic consultation. We understand how important a straight, beautiful smile is. We offer a wide variety of treatment options, ranging from traditional, time-proven appliances to the latest innovative orthodontic advancements. Our highly trained staff utilizes the most modern up-to-date technology, providing a wide variety of orthodontics and dental specialty treatment options at our newly constructed dental office in Concord, California. Looking for an orthodontist in Concord, California? Whether it’s Invisalign, clear braces or metal braces, it’s always your choice at Patino Orthodontics. Including free complementary initial exams that are available to all our east bay orthodontic patients. Five star orthodontic service and patient comfort is our top priority. High-end braces, Invisalign and Invisalign Teen offered. Answering service is available 24/7 and emergencies are responded to quickly. Affordable payment plans and discount options are available to all patients. Patino Orthodontics in Concord, CA is open six days of the week. Read some of Dr. Patino’s recent patient reviews on our Google+ page, Yelp, or like us on our Facebook page. Dr. Patino is fluent in Spanish. Spanish speaking patients can fully understand all aspects of their treatment.